Spring Cleaning can be a real chore, and it isn’t something you just do in the spring. 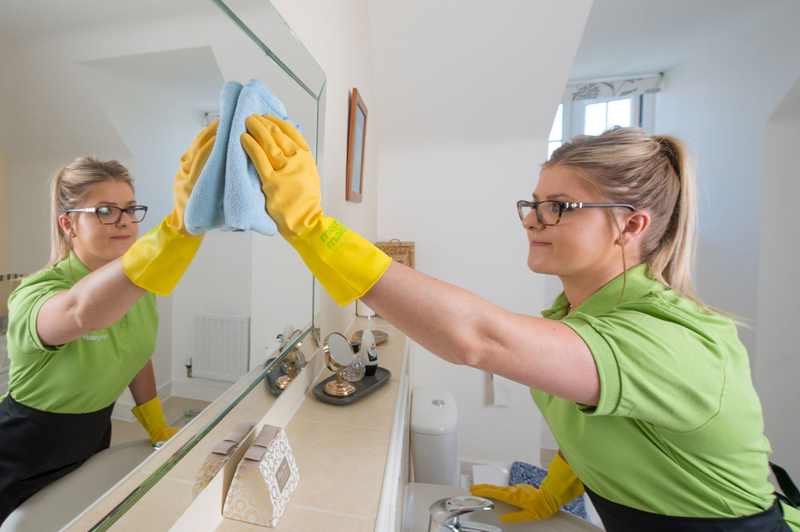 Merry Maids offer a spring cleaning service, but if you want to try it yourself we’ve come up with a few pointers to follow and help you along the way. Stone can be scratched by everyday grit and damaged by some of the most common household substances, including the old cleaning friend, vinegar. Take care of stone and it will even outlast you. Dust stone worktops often to remove grit and crumbs, otherwise there is the danger that they can be ground down by pots and pans and scratch the stone. Use a clean, dry micro fibre cloth to wipe up spills immediately to avoid staining. To clean a stone worktop, first try using only warm water. Wipe dirt and marks off with a soft cloth or sponge. Let caked-on food soak for a while before wiping. You should be able to remove spills, crumbs, sauces and other substances this way. If not, add a little washing-up liquid to the water. Rinse well with clean water, because leftover soap can leave a film or cause streaking. Avoid stronger cleaning products, such as bath and tile cleaners and scouring powders. These can stain or scratch your stone. Never use vinegar, lemon juice or other acidic cleaners on marble, travertine or limestone. The acid will eat away at the calcium in the stone. Prevention is better than cure, so if you know you will be cooking something that could spill over, protect the bottom of your oven by placing the baking dish on a baking sheet to catch the spills. Before you start to clean, you should always refer to your hob and oven manufacturer’s manual for information on appropriate cleaning methods for your model. (The one you carefully filed, when you bought them, just for an occasion like this). Proper cleaning of your ovenimproves its efficiency, extends its life and, most importantly, reduces the risk of fire. To clean your hob, wipe oil and other spillages away with a paper towel, then wipe the surfaces with a moist sponge and a solution of washing-up liquid and warm water or a 50-50 solution of vinegar and warm water. Do not use a scouring pad as this will scratch the surface of the hob. Wipe the exterior surfaces of you oven to remove food spills every time you wipe down worktops. All you need is a moist sponge. Make it a habit and you’ll save time in the end, because even the exterior surfaces get warm enough to bake food on very quickly. To clean the interior, start by removing all oven racks and grill pans. Wash them by hand in the sink using a solution of warm water and washing-up liquid. Scrub with a nylon bristled brush or other gentle, non-metal scrubber. Anything abrasive, such as steel wool, will scratch the metal’s finish, which can lead to the racks and grill pan rusting; it will also make food stick even more the next time. Loosen baked-on deposits in a conventional (non self-cleaning) oven by filling a glass bowl with ½ cup of full-strength ammonia. After making sure the oven is completely cool, put the bowl of ammonia in the oven, close the door and let it stand overnight. The fumes will release the bond between the crusty food and the oven interior. The next day, open the door and let the fumes dissipate; then remove the bowl and wipe away the loosened food with a cloth or sponge. To remove stubborn food that remains after the ammonia treatment, try scouring with a nonabrasive scrubbing pad dipped in a solution of warm water and washing-up liquid. As with the racks and grill pans, avoid scratching the oven’s surface. On flat surfaces, such as door glass, try scraping with a plastic scraper. Only use a commercial oven cleaner if the above does not work. Follow directions carefully and wear protective rubber gloves when applying the solution. These products are very strong and harmful. Never spray a commercial oven cleaning on a hot oven, electric elements or oven lights. Heat can make the cleaner even more caustic. If you own a self-cleaning oven, be aware that it will need some cleaning. Self-cleaning means that it will break down food spills with temperatures as high as 480c, however, the high heat doesn’t reach areas such as the frame and edge of the door and the self-cleaning cycle can actually bake food on even more. Merry Maids advice is to clean those parts first with a nonabrasive scrubbing pad dipped a solution of hot water and washing-up liquid, finally rinse well using a sponge and clean water. Throw out any expired food, mostly empty containers, and items that you bought and never used. Put the stuff to keep on the counter. Take out the refrigerator shelves and drawers. Wash them down, with warm soapy water being careful with glass shelves. Using a solution of four tablespoons of baking soda to one litre of warm water, wipe down the entire inside of the refrigerator and freezer, then replace the shelves and food. Don’t forget to vacuum the coils of your UNPLUGGED refrigerator if it is free standing. This is a great time to sweep or vacuum, then mop underneath it too if you can find some help to move it. Be careful of scratching your floor. Apply a light misting of undiluted white vinegar from a spray bottle to clean chrome fixtures on your oven. Merry Maids suggest finishing off by polishing with a soft micro fibre cloth to achieve high shine and remove any smears. Merry Maids say that it’s quite safe to ignore boiled over liquid spills as they will evaporate, however dried on food will carbonise so brush off carbon dust gently with a wire brush. It is important to immediately wipe away spills from enamel surfaces with a damp soft micro fibre cloth and clean weekly with special enamel cleaner. Merry Maids recommend looking for one that is VEA (Vitreous Enamel Association) approved. To clean the inside of your washing machine open it up and wipe down the inside of the door with a cloth and a solution of warm water and washing-up liquid. Use an old toothbrush to clean the crevices of the molded frame around the door. If you have a removable detergent compartment, take it out to clean it. If it’s built in, clean it as thoroughly as you can, using a pipe cleaner, if necessary. The rest of the interior will be cleaned every time you use it. Wipe the exterior of your washing machine with a cloth and a solution of warm water and washing-up liquid. Merry Maids recommend running the dishwasher empty with vinegar or baking soda added to the detergent compartment. If your dishwasher has a food trap in the bottom, clean it out. Wash down the outside of the dishwasher with a solution of warm water and washing-up liquid. If your microwave is harbouring nasty odours then try filling a cup with water and lemon juice and heating in the microwave until boiling. This will not only get rid of the smells but will also help to loosen any food spills which can be wiped away easily. Pour 1/2 cup baking soda down the drain, followed by a cup of vinegar. Let the mixture foam for a few minutes before flushing with boiling water. Lastly if you have a rubbish disposal, finish up with some ice cubes to sharpen the blades and old citrus rinds to freshen up.